Headstone of John Montgomery Ward and Katherine W. Ward. 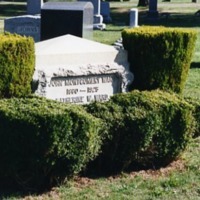 A photograph of a headstone for John Montgomery Ward and Katherine W. Ward surrounded by green shrubbery. The grave is at the Greenfield Cemetery in Uniondale, N.Y., in section 2, lot 185, grave 2.